- Fashion Ecstasy on 五月 10, 2013. Up until a couple of years ago when I still had perfect skin, I would pass out with my make up on and roughly cleanse my face with body soap the next morning. However, event life is not easy. All the late nights and the over intake of alcohol, trans fat and sodium finally resulted in fine lines, dark circles and screaming pores on my face. It is sad, but I have to start accepting the fact that I am passed 25, time to start taking care of my skin. 2 weeks ago I started using Andris Kener’s Revitalizing Serum. The product claims to have proven solutions for skin rejuvenation and tightening without having to go through invasive procedures such as plastic surgery, steroids or chemical peels. After reading this powerful piece of description, I decided that I must try it for myself. In the description I’ve also noticed that the secret weapon of the product is something called EGF (Epidermal Growth Factor) peptides, a substance that reverses premature aging by stimulating tissue regeneration and collagen production. EGF was initially used to treat skin burns years ago, I’ve had a few laser treatments before and one of them was for a skin burn. So, from experience I knew this product was safe to use even for post- surgical/laser care. The post-care is often painful and hard to follow after a laser treatment. I was told to only use products that didn’t contain fragrance or any substances that may irritate the skin and somehow these products always gave me other problems such as acnes. Andris Kener’s Revitalizing serum did not give me any of the problems and with the results I don’t think I’d ever have to go for laser treatment again. The left picture was taken two weeks ago before I started to use Andris Kener’s Revitalizing Serum and the right one was taken today, after trying the product for two weeks. Notice that my fine lines and pores are less visible and my skin is smoother. Andris Kener Inc. is a Canadian company that originated in Vancouver. The Revitalizing Serum was made by a medical specialist who cared for his patients’ skin conditions. It is really easy to absorb, it doesn’t clog and in the morning it gives my skin a flawless texture without even applying makeup. For the past two weeks I’ve noticed a significant improvement on my complexion and thus I am here sharing it to all Fashion Ecstasy readers. 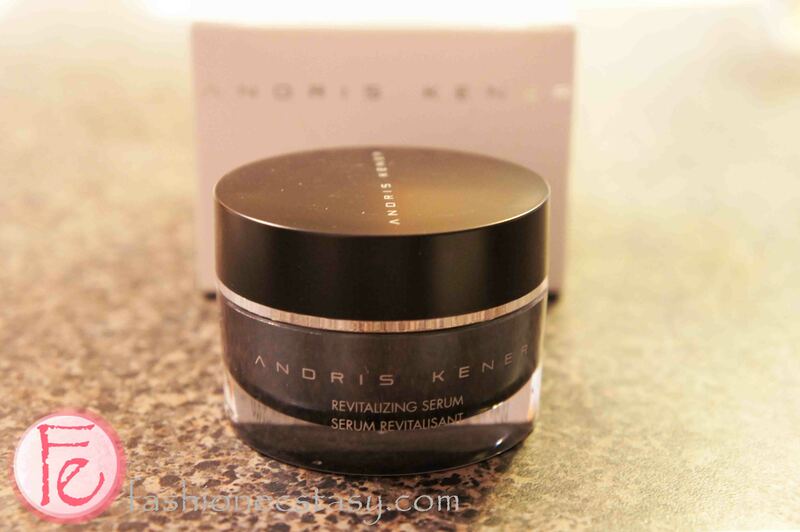 We are giving away 1 full-sized Andris Kener Revitalizing Serum ($100 worth). All you need to do is share this post via Facebook and/or Twitter for a better chance to win! Andris Kener is also offering an exclusive 10% discount code for Fashion Ecstasy readers & fans only. Use the code “FashionEcstasy10” and receive a 10% off on your purchase! The before and after pictures are remarkable! I’d love to try this product. i’d love to try this product to see some good change in my skin! I have been following your blog for a year and I really trust your opinion. I would love to try this product! EGF (Epidermal Growth Factor) peptides, a substance that reverses premature aging by stimulating tissue regeneration and collagen production – sounds absolutely perfect for the 40 something face! I’m becoming more and more obsessed with skin care products. I’d love to try this! I want it because the before and after pictures are awesome and I really need that after picture for me! As i get older i’m obssessed with skin products and the results of this look amazing so i would love to try for myself. I would like to try it on the circles under my eyes.